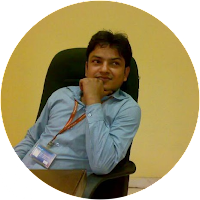 We were discussing the basic concept of streamline and equipotential line, dimensional homogeneity, Buckingham pi theorem, difference between model and prototype, basic principle of similitude i.e. types of similarity, various forces acting on moving fluid and model laws or similarity laws in the subject of fluid mechanics, in our recent posts. 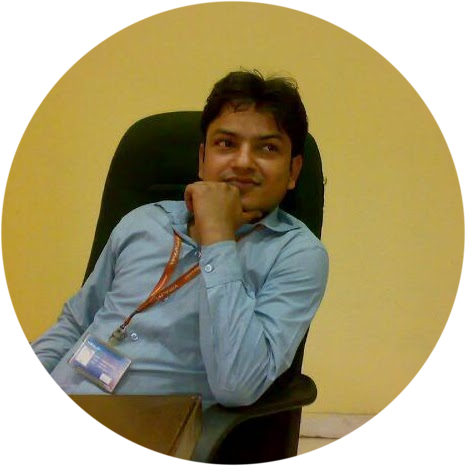 Now we will go ahead to understand the fundamentals and derivation of Euler’s equation of motion of a fluid, in the subject of fluid mechanics, with the help of this post. Euler’s equation of motion of an ideal fluid, for a steady flow along a stream line, is basically a relation between velocity, pressure and density of a moving fluid. Euler’s equation of motion is based on the basic concept of Newton’s second law of motion. When fluid will be in motion, there will be following forces associated as mentioned here. In Euler’s equation of motion, we will consider the forces due to gravity and pressure only. Other forces will be neglected. 2. The fluid is homogeneous and incompressible. 3. Fluid flow is steady, continuous and along the streamline. 5. Only gravity force and pressure force will be under consideration. 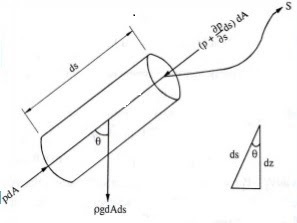 Let us consider that fluid is flowing from point A to point B and we have considered here one very small cylindrical section of this fluid flow of length dS and cross-sectional area dA as displayed here in following figure. Let us consider that θ is the angle between the direction of fluid flow and the line of action of weight of the fluid element. Net force over the fluid element in the direction of S = Mass of the fluid element x acceleration in the direction S.
Above equation is termed as Euler’s equation of motion. 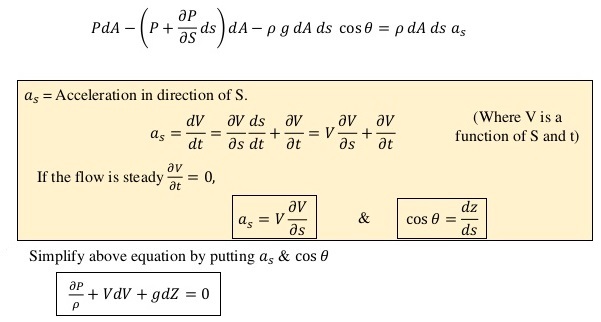 We will now derive the Bernoulli’s equation from Euler’s Equation of motions, in the subject of fluid mechanics, in our next post.